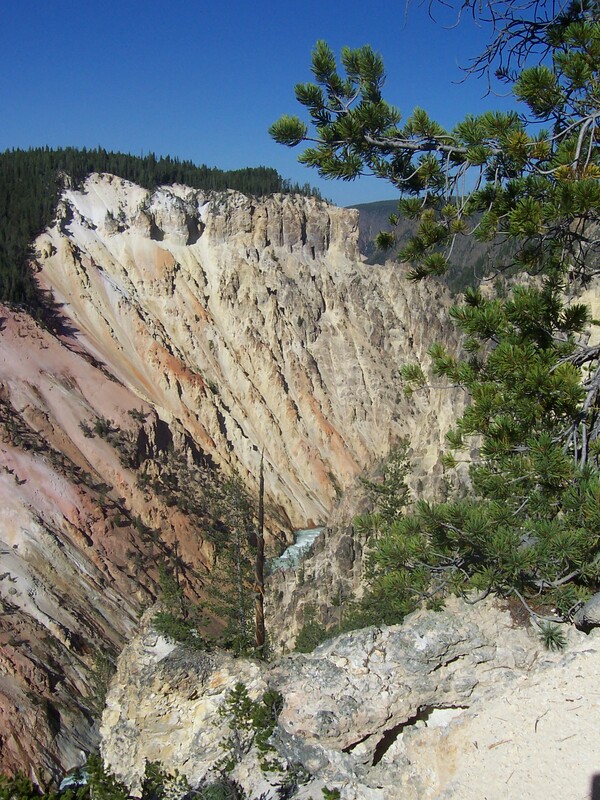 It’s time for my Awesome Trip to Yellowstone National Park: Part Deux. 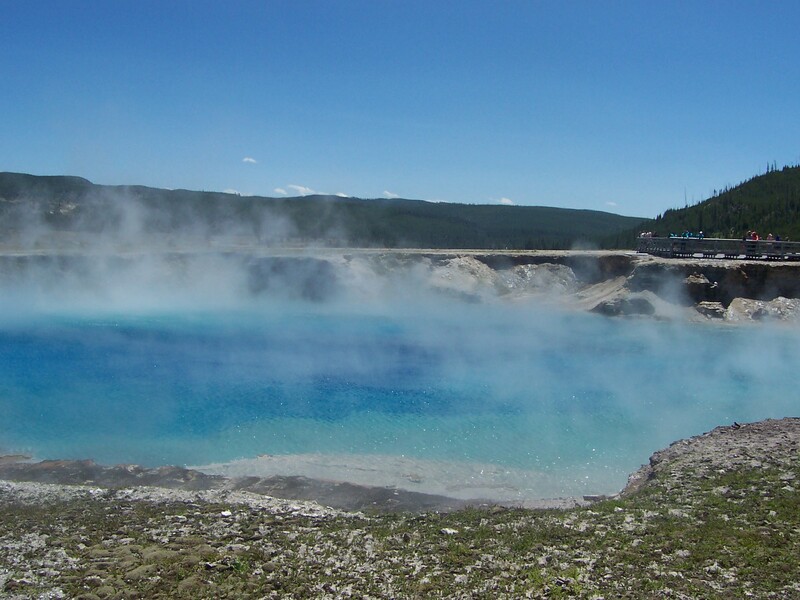 If you missed Part I (“Hello, Supervolcano!“) then you can catch up here. Otherwise, read on for the awesome. 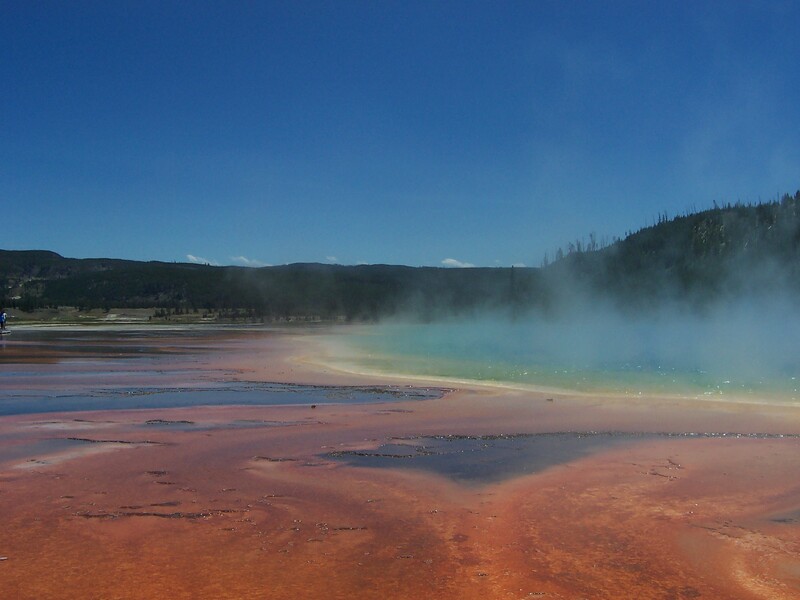 You can see all the steam from this hot spring rising into the air. 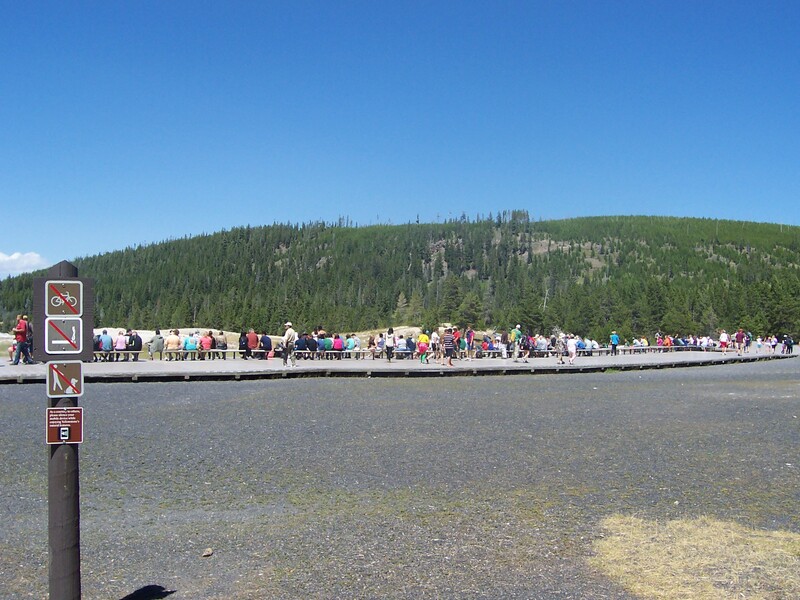 There’s a wooden boardwalk (full of people) crossing the Firehole River, leading up and over the hill. The sun was beating down, but the wind was quite chilly and fierce. It was a great time to be in the park. Isn’t that rock simply gorgeous? 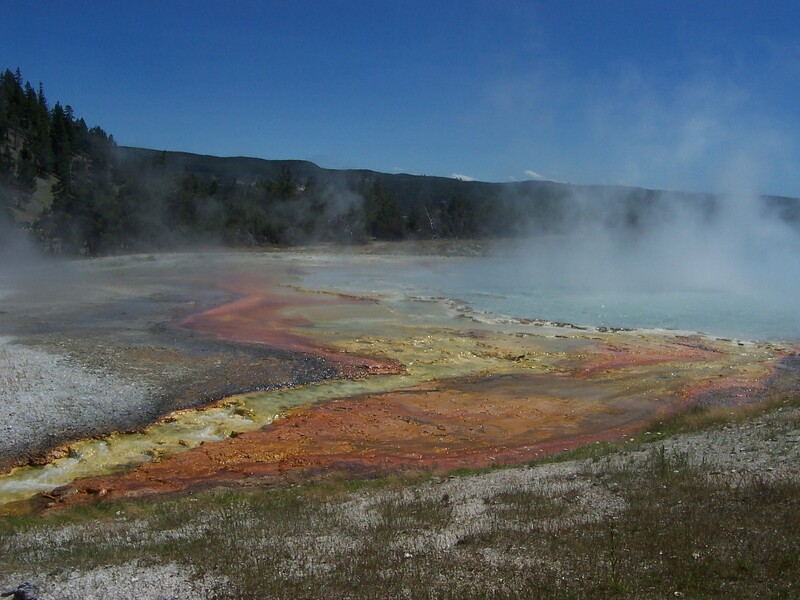 Yellowstone is home to trillions of different microbes, organisms that include bacteria, algae, and archaea. 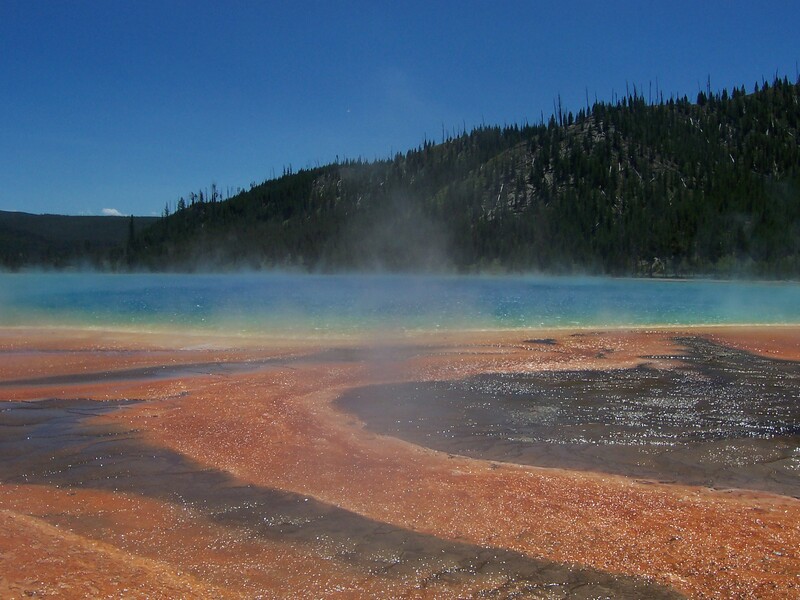 Archaea (pronounced ar-key-uh) are a category of microbes that may be descended from the earth’s earliest life forms. They are Code Name Cool, as far as I am concerned. 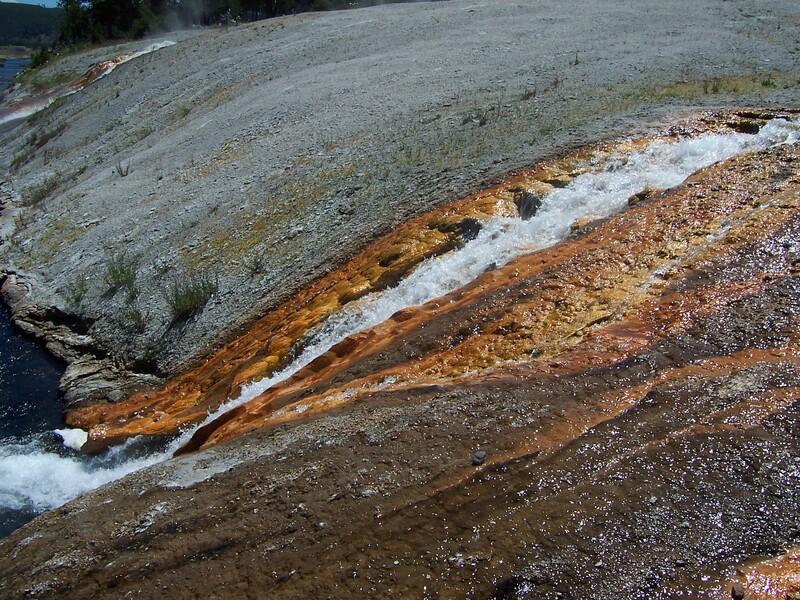 The microbes at Yellowstone are some truly badass microorganisms, as they inhabit water too hot for humans to safely touch, and many thrive in acidic or alkaline environments. There are at least 15 hats in the water in the above picture, the bright pink one being the most obvious, and probably the only one you can see without the picture being blown up. 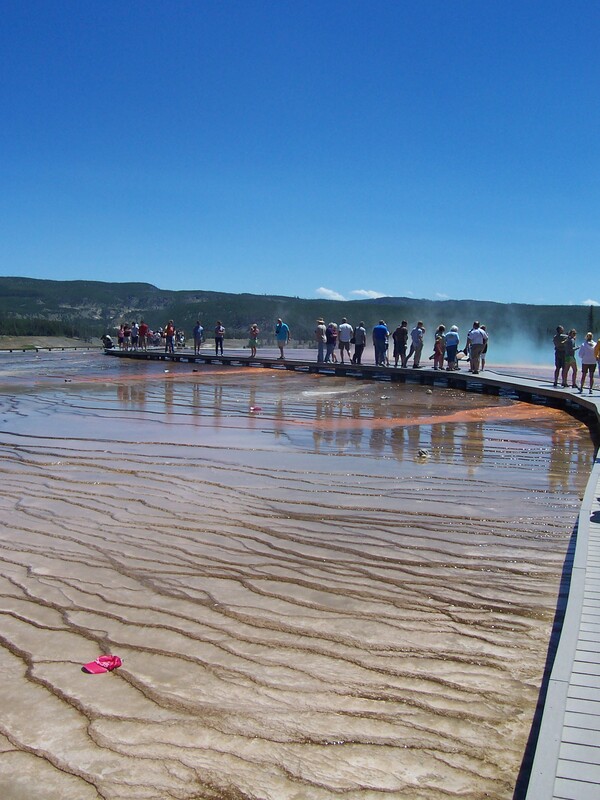 It’s a view of the boardwalk around Grand Prismatic Spring, and because of the wind, children were the ones most likely to lose their headgear, though there were plenty of adults who lost hats as well. 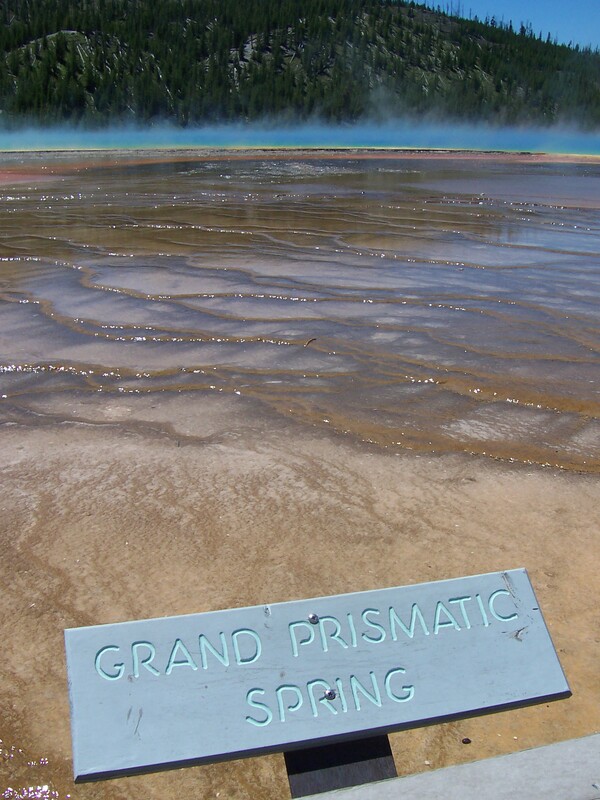 I mean Grand Prismatic Spring, of course. 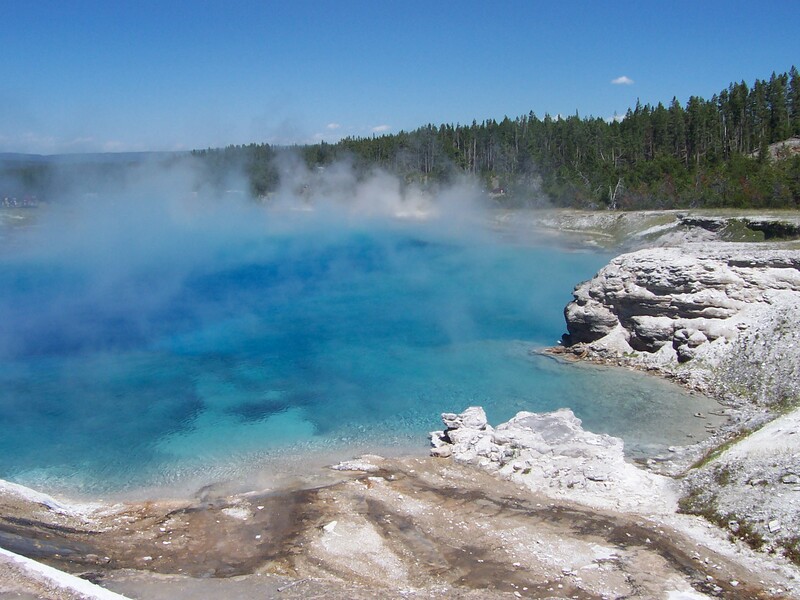 Can you see the gorgeous bright blue color reflecting into that steam? 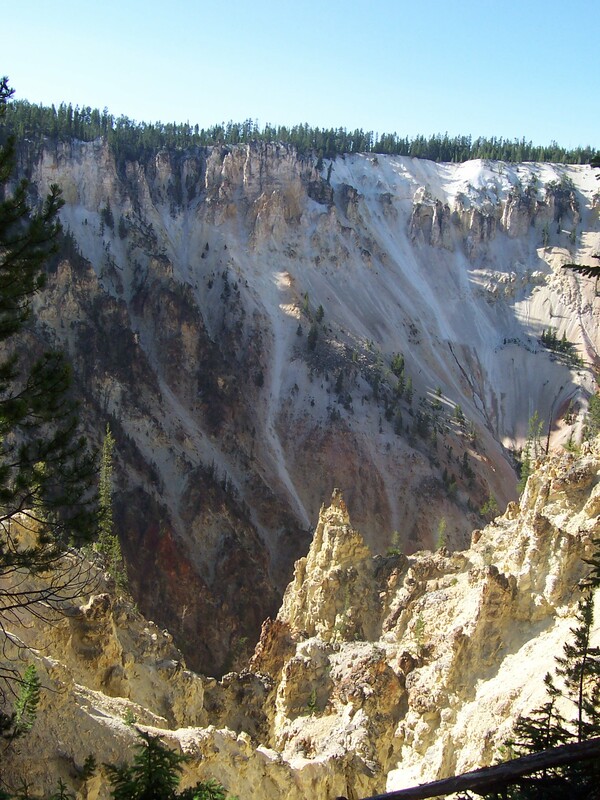 Isn’t Yellowstone amazing? 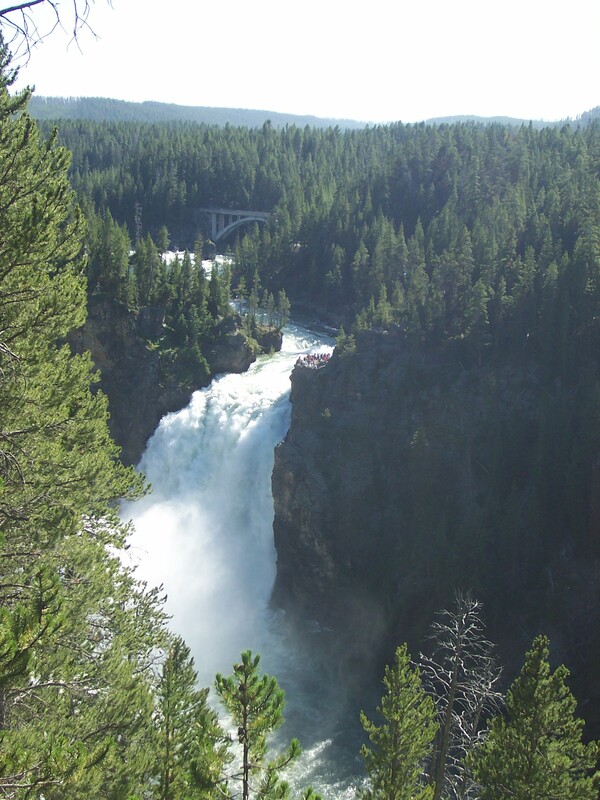 Americans are so lucky we have this wonderland right here in our country, to go and marvel at any time we feel like driving to Wyoming. I think I heard more Hindi, Urdu, German, and French around me than English. An experience that reminded me of hiking to Delicate Arch in Utah before sunset one time. Except that time, there was also a ton of Japanese in the language mix. 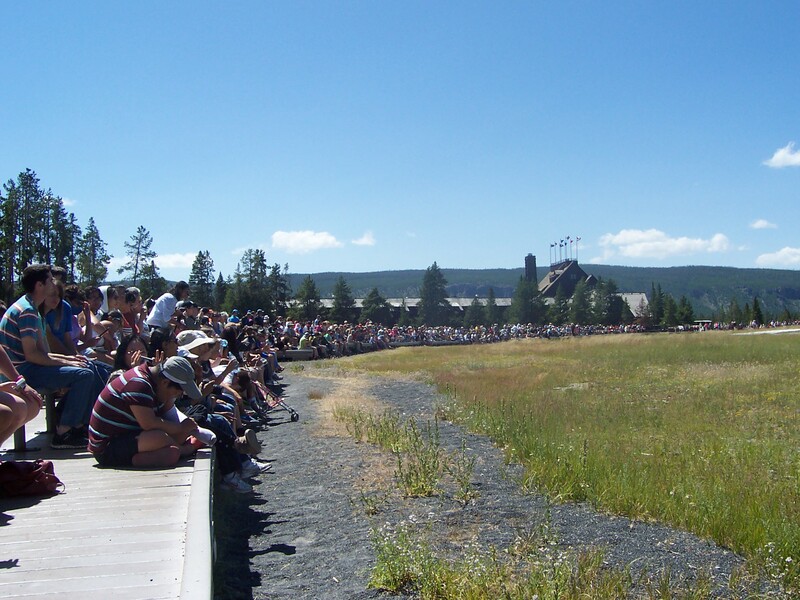 Though I did see plenty of Japanese tourists in Yellowstone, I just happened to hear less of their language around me, and more of the others. 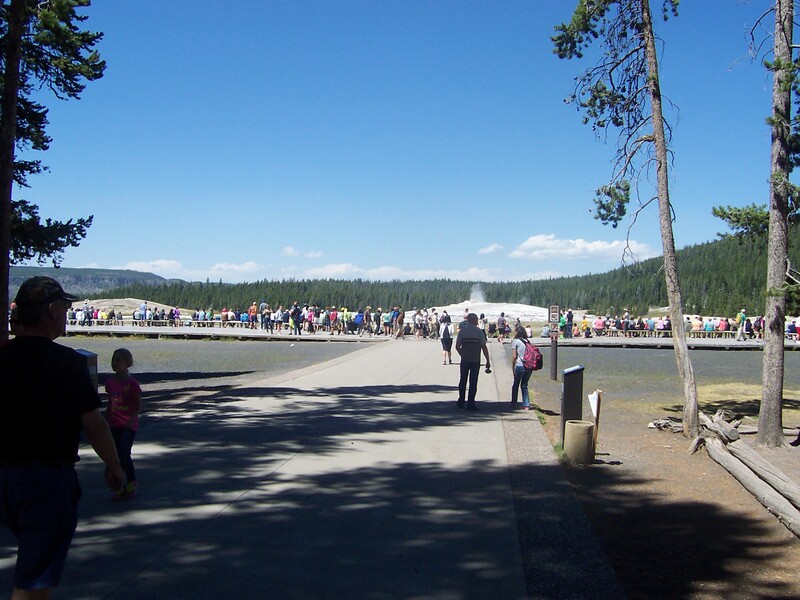 After our visit to Grand Prismatic, Greg and I drove south once again, and arrived at Yellowstone Central, aka, the facilities that surround Old Faithful. 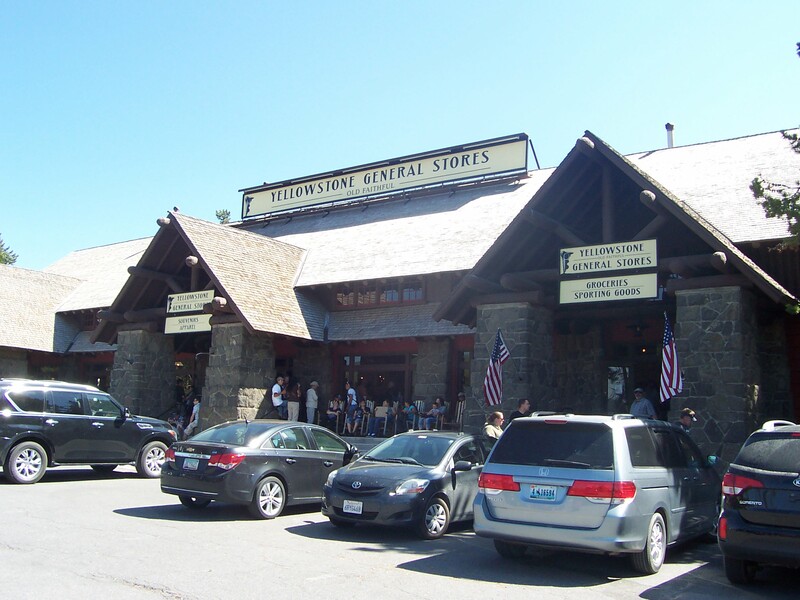 There’s a huge, gi-normous parking lot here, as well as lodges, staff housing, a gas station, gift stores, a grocer… um, yeah. 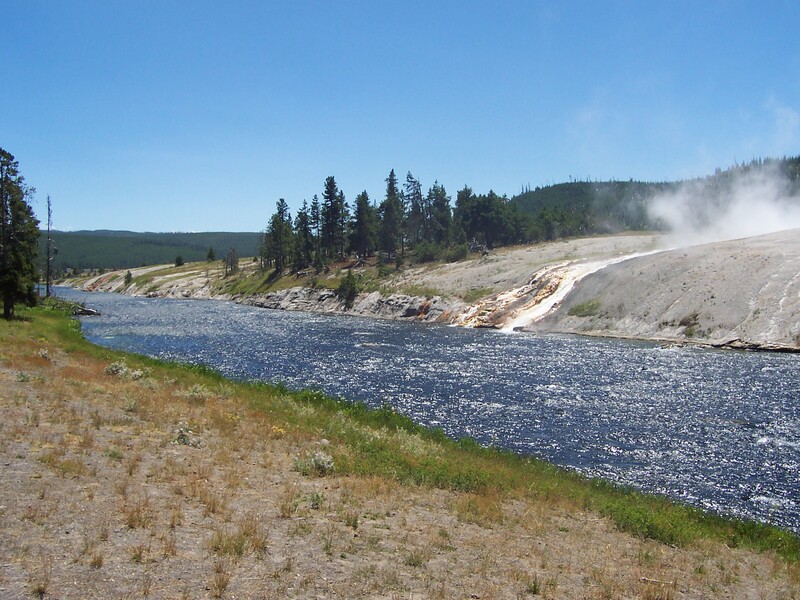 It’s Yellowstone Central. 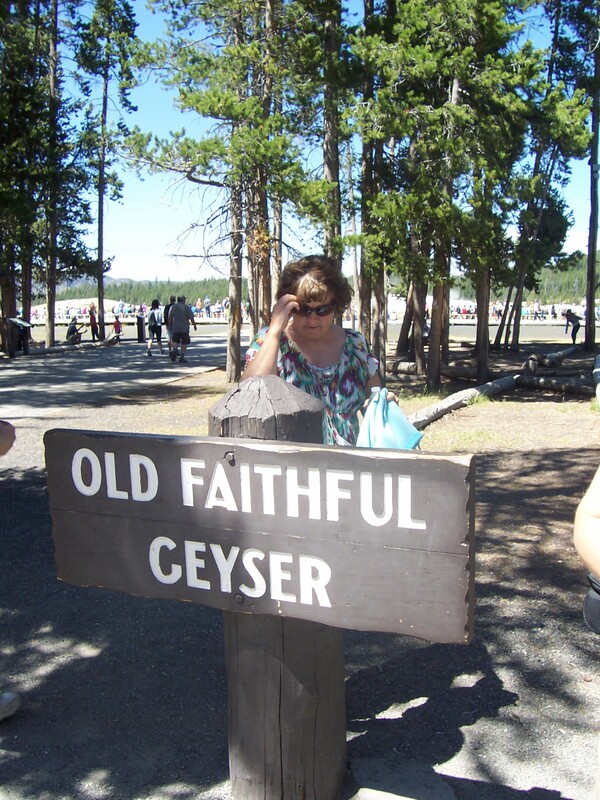 She was walking up to usher in the next family to pose for a picture around the Old Faithful Geyser sign. Now she is Super Famous because she’s on my Author Blog like a Rock Star. 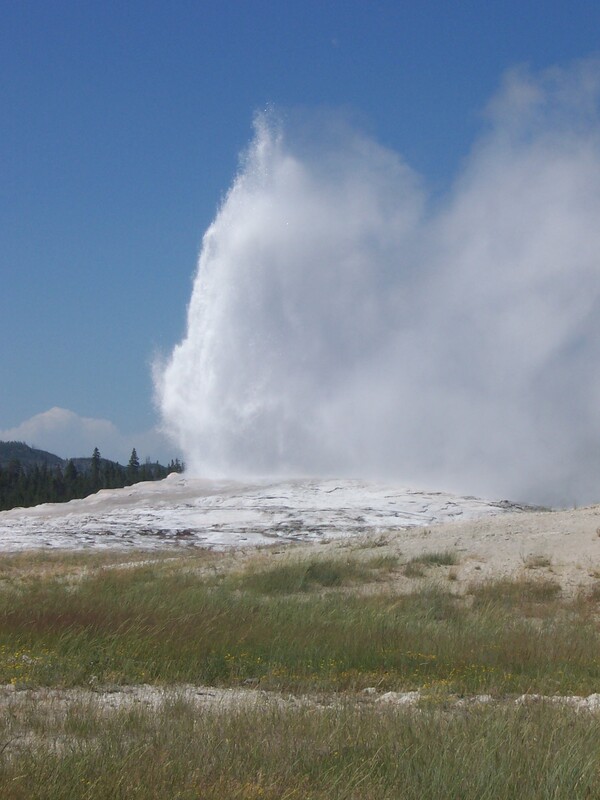 And that be Old Faithful. 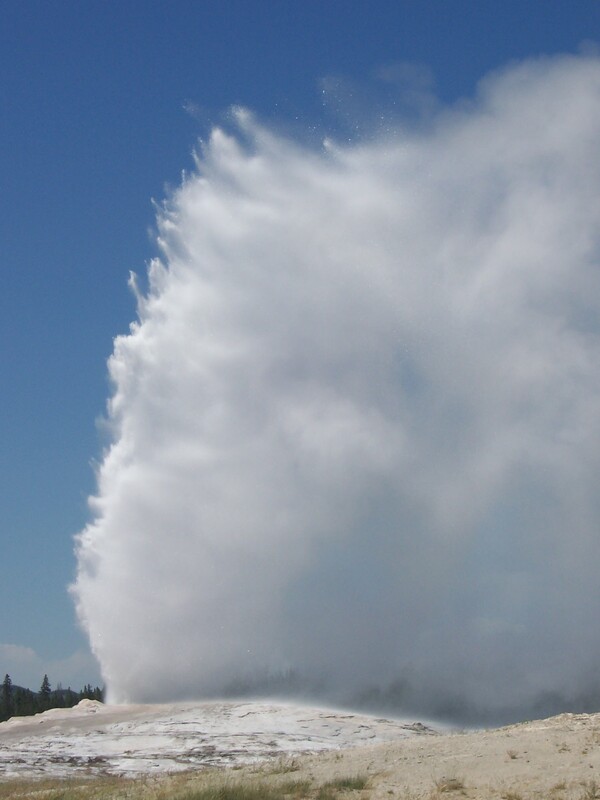 Waiting to blow. Greg is in the picture above, but he’s super tiny. He’s sitting on the second section of log-seats past the walkway. The building there is one of the lodges, which also had a large cafeteria and ice cream shop. 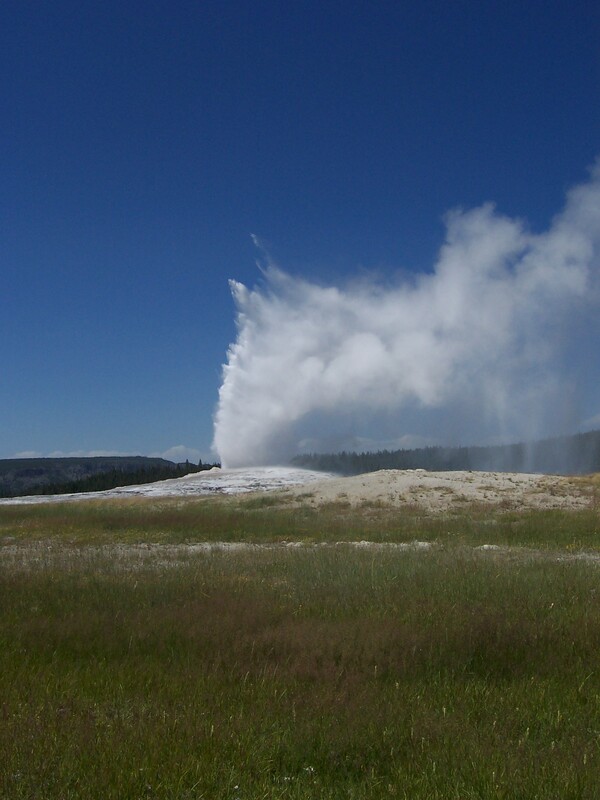 Here’s a picture I took about 15 minutes before Old Faithful erupted. I sat on the edge of the boardwalk, and that empty space beside me filled up right after I took this photo. 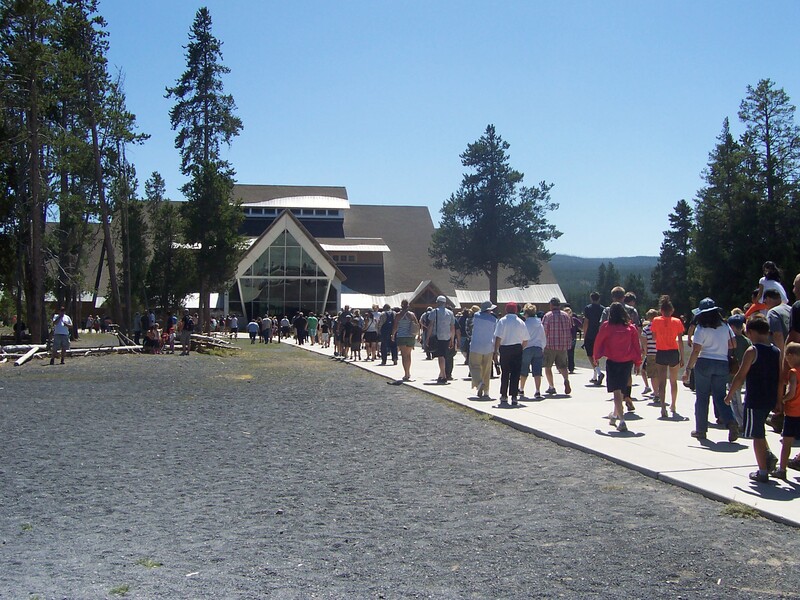 The building behind those people is the Old Faithful Inn, which takes reservations like, two years in advance. It’s only open in the summer. It’s a really cool sight. Which I watched with at least 5,000 other people that afternoon. 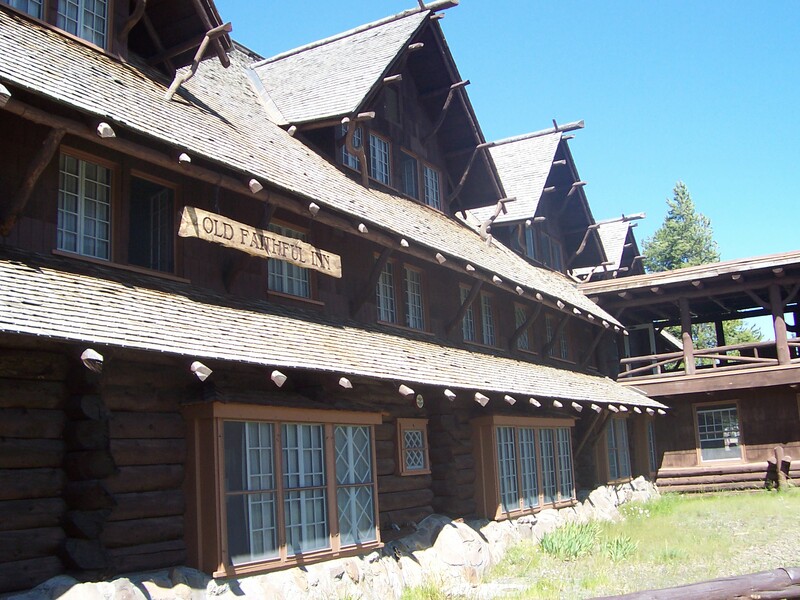 The Old Faithful Inn has a tower that faces the center of the building, which has a massive fireplace. The tower is called the Crow’s Nest, and an orchestra used to play up there, while people danced or watched the dancing from the first and second floors. 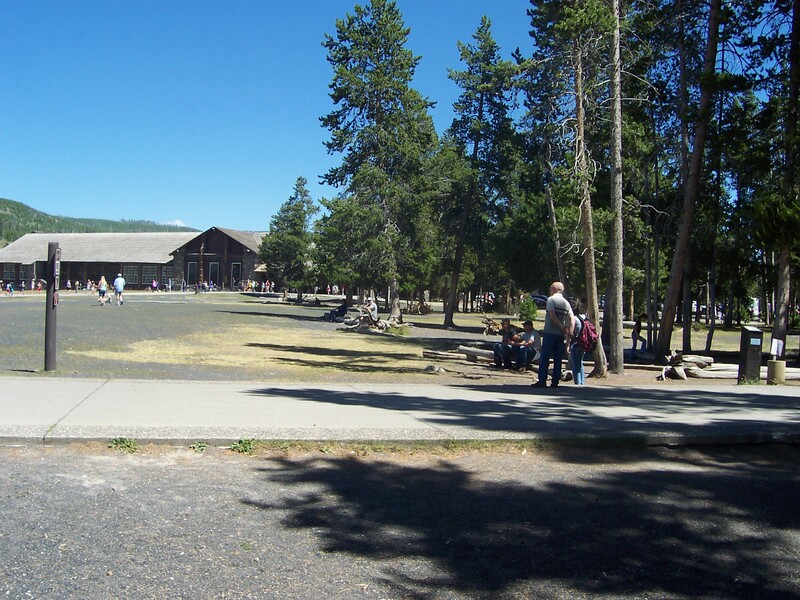 In 1959, an earthquake outside the park affected the foundation of the building too much to allow visitors into the Crow’s Nest anymore. I don’t have pictures because my camera does a poor job with interior shots. It’s a Kodak from 2006, and yes, I should replace it, but my uncle gave me this camera as a wedding gift, so I can’t bring myself to trade up. Hence, no Crow’s Nest pictures, sorry. 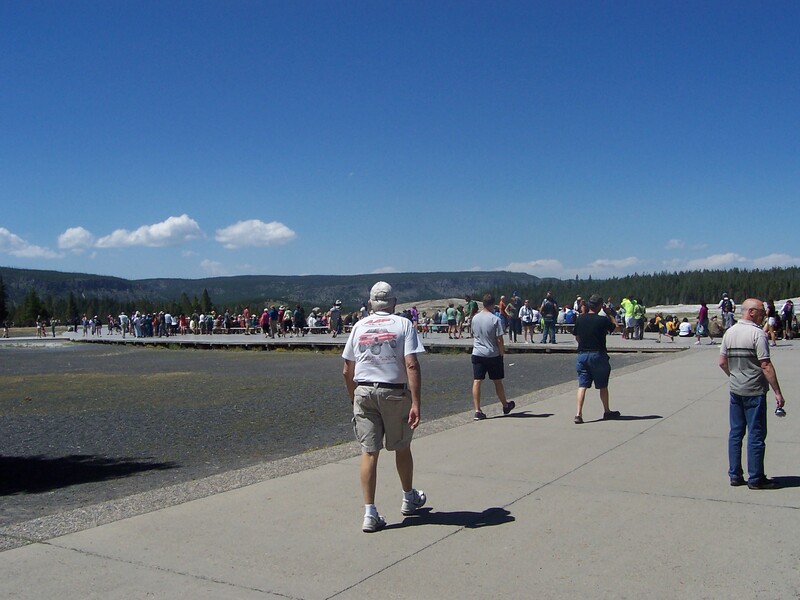 Greg is standing in the entrance on the right, by the flag. He is Tiny Greg again. Greg and I did buy fresh huckleberries from a roadside stand in Montana, and they tasted like blueberries with a bit of cranberry zest. Greg also bought 2 bottles of huckleberry wine. 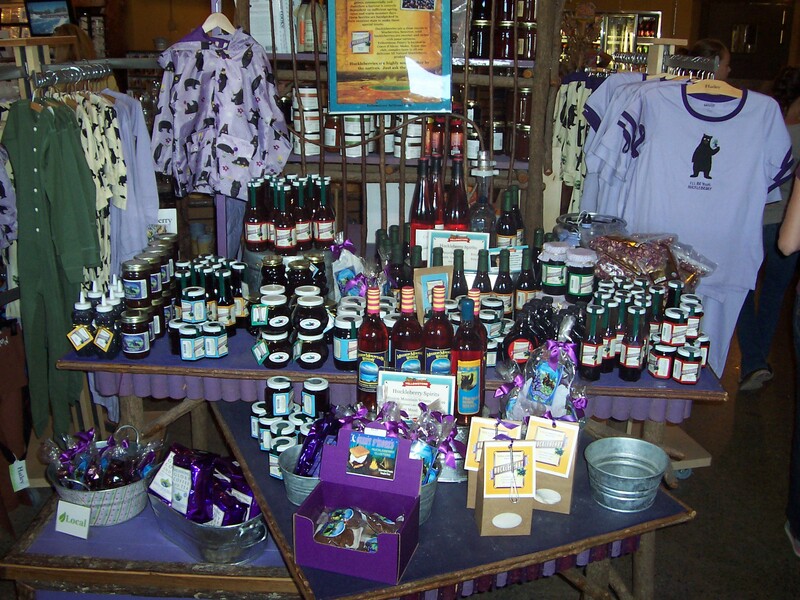 One bottle in Montana, and one from the display pictured above. The Montana bottle was like, $24.99, and the brand on offer in Yellowstone was $14.99. Greg said the Montana brand was a lot better than the wine he bought here. 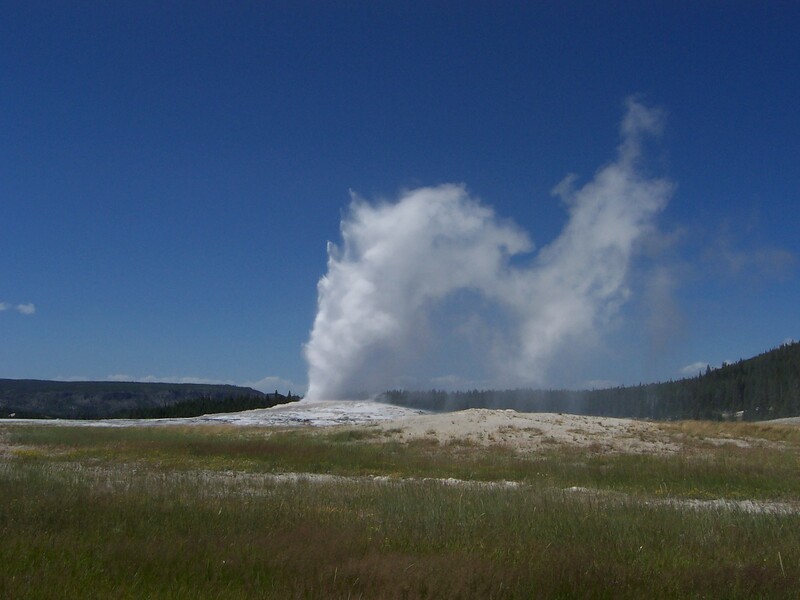 After our visit to see Old Faithful, we left Yellowstone Central and drove through the southern part of the figure-8 loop through the park. 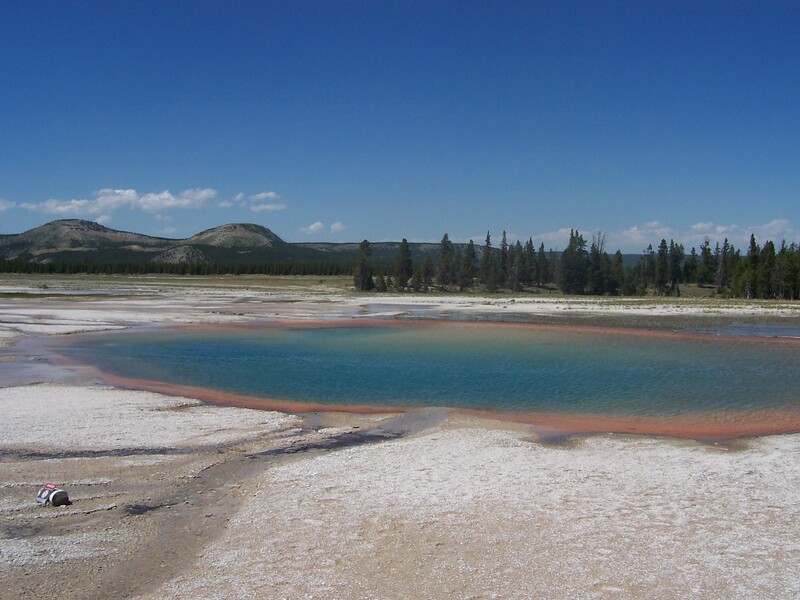 We passed the south entrance, then headed north again, around Yellowstone Lake. 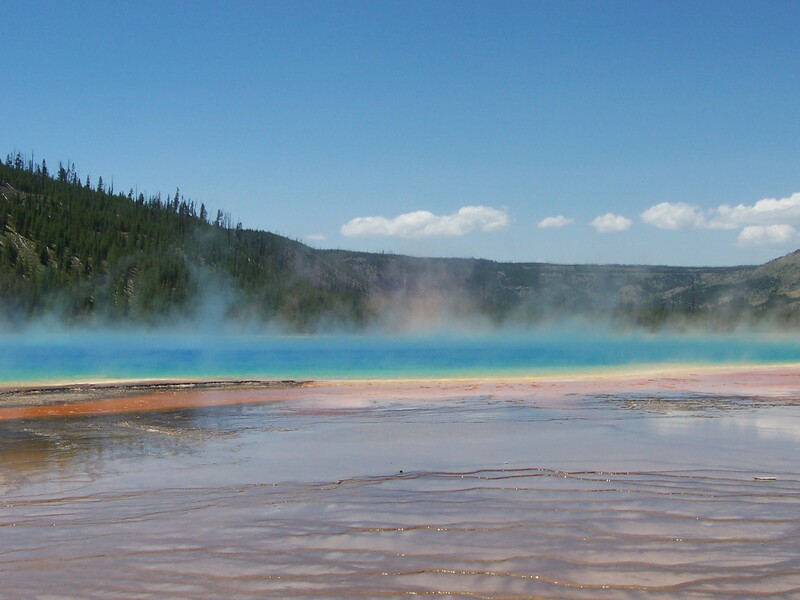 Yellowstone Lake is the largest high-elevation lake (above 7,000 feet) in North America. I didn’t take a picture of it because I am lame. 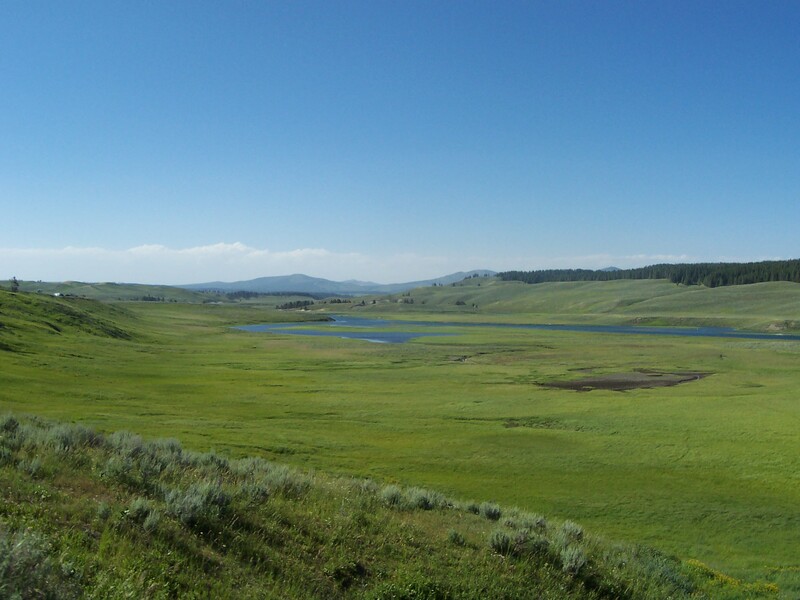 Instead, I took a picture of the grassland around the lake, because just look at this green!! And that’s the display in my old camera– it was much more brilliant than this photo can show. There were some bison scattered around in this area, munching. I didn’t stop to take pictures of them because 1.) I’ve seen bison up close before, and petted tame ones kept as pets, and 2.) there were plenty of other people taking pictures of them, and I was like, yeah, I’m good. This is a HUGE waterfall. Even as far away as I was, taking this picture, the air was thunderous. I don’t know why I didn’t think to take a selfie in front of the waterfall or the canyon. I think I was a little tired from running the trails and the boardwalks trying to see everything, despite the delays made by the crowds and the issues with parking. As you can see from the empty parking spaces behind me, traffic was far less of a problem in the late afternoon than during the morning and midday. But while there might be a plethora of open parking spaces here, the final viewpoint I visited was still extremely crowded, and the loudest access point I visited. People were really noisy there. 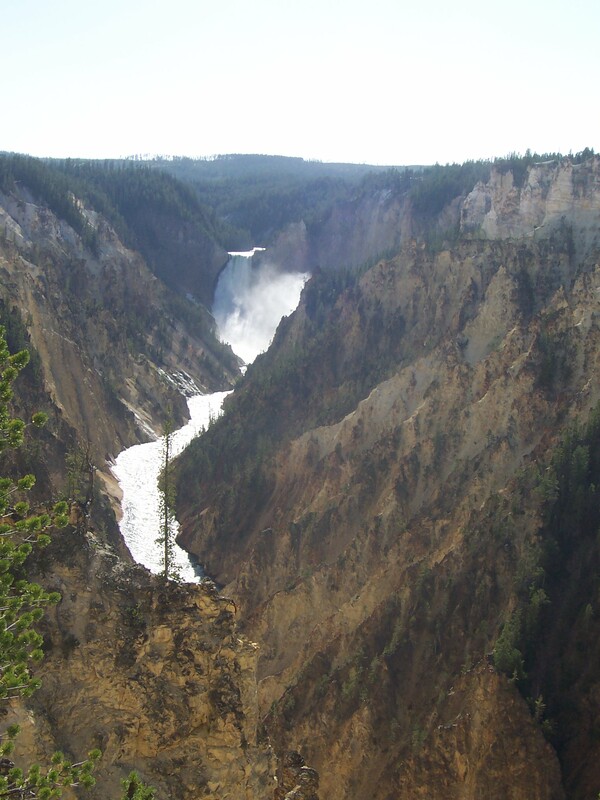 When we left Yellowstone Park, we drove south through the Grand Tetons and into Jackson Hole. I don’t know what it is about Californians who leave California for Rocky Mountain locales, but they frequently get very vocal about snow. And they like to pontificate. Loudly. I should note that my friend Laurel, who moved here from California decades ago, has never once given me an earful about snowfall. (Thank God.) Nor has any Californian who has lived in Colorado since 1995. It seems to be the post-2000 Sunshine State diaspora that acts like this. I find the conversation beyond tedious. If I ever write a skit for the Durango Follies, a comedy show that’s put on every February for SnowDown here, I’m going to feature character-me in the skit, and I’ll let character-me say the sort of things I never say to the snow-complaining/snow-pontificating members of this diaspora in real life. Because the Durango Follies are written and performed for Durangatangs, and the best humor is always the stuff everyone else is already thinking, but doesn’t say either. Greg and I didn’t stay the night in Jackson because everything was booked. We drove way out to the middle of nowhere, and camped in a little town called Pinedale, where the temperature dropped to below 40 that night. It was our last night on the road, and I slept great. 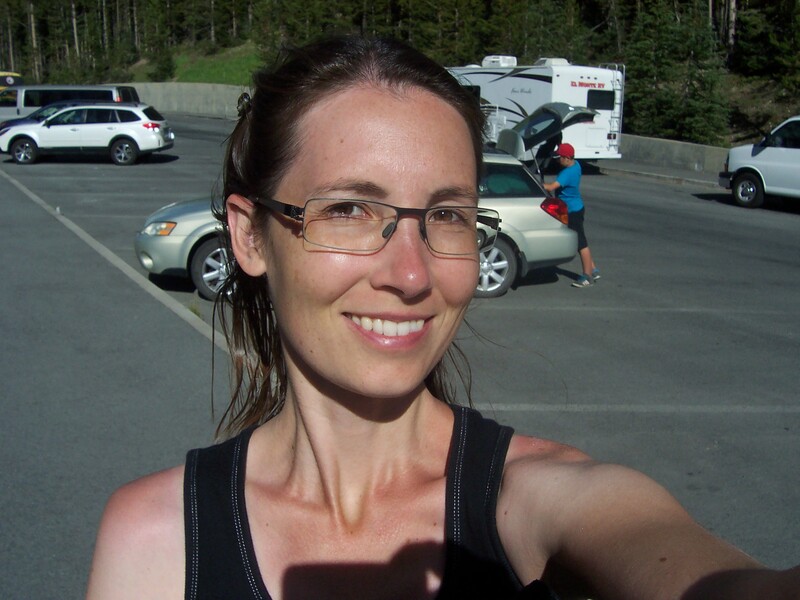 Thanks for reading about my trip to Yellowstone! I hope you enjoyed the pictures!